The guitarist had to earn his money as a country composer in Nashville for seven years, where Steve Earle, born on January 17, 1955 in Fort Monroe, Virginia, Texas, had lived since 1975. He first played the trumpet, and at the age of eleven he took up the guitar. Since 1969 he performed in clubs and wrote songs together with Townes Van Zandt before releasing the EP'Pink And Black' on the Nashville label LS 1 Records. In 1982 Earle produced his debut album CADILLAC with a country / rockabilly mixture, in which his record company Epic Records placed little trust and cancelled the contract in 1984. The change to MCA Records got the -atmospheric Rock'n'Roll on the semi-acoustic Klampfe- (Musik Express) well. In the style of Waylon Jennings' or Willie Nelson's country outlaws, Steve Earle produced his 86 LP GUITAR TOWN (US #89). Who led the country charts in the fall of the year. In Earle, Rolling Stone recognized a New Country pioneer alongside Dwight Yoakam and Ran-dy Travis. Steve Earle performed at the Grammy Awards in Los Angeles in February 1987 and then put together his backing band Dukes with Zip Gibson (g), Kelly Looney (b), Craig Wright (dr), Ken Moore (key) and Bucky Baxter (steelg). He presented it in summer 1987 on the album EXIT 0 (GB #31, US #90), which sold better in Great Britain despite typical North American music. 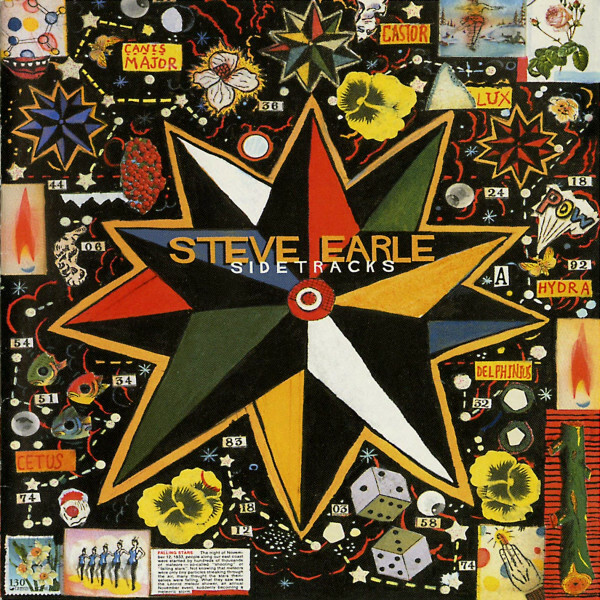 At the end of 1988 Earle sought new stylistic challenges with the mainstream rock influenced material of COPPERHEAD ROAD (GB #42, US #56). Keyboards were used to create bagpipes, a romantic mandolin mixed with sharp guitar riffs, Celtic sounds with country rock. Earle obviously wanted to break with Nashville traditions. In 1988 he delivered his version of the classic'Six Days On The Road' for the soundtrack to the John Candy / Steve Martin film -Planes, Trains And Automobiles- and released the singles'Copperhead Road' (GB #45) and'Johnny Come Lately' (GB #75). Tours, including Bob Dylan's supporting programme, and concerts were on Earle's schedule in 1989. In the summer of the following year, Joe Hardy co-produced THE HARD WAY (GB #22, US #100) was released. From shirt-sleeved country to rockabilly to stomping rock'n'roll (hifi vision), the man with the nasal voice and the reserved guitar playing dominated the entire spectrum of US pop. In July 1991 he gave several concerts in the UK, including the Cambridge Folk Festival, introducing SHUT UI' AND DIE LIKE AN AVIATOR (GB #62). Drug problems got the hard rocking country musician (billboard) into trouble. When large quantities of cocaine and crack were found in his car in 1992. He was sentenced to just under a year's imprisonment. Visibly recovered, he recorded TRAIN A COMIN' in 1995 and performed live again for the first time in Nashville on April 18. In October he worked for Emmylou Harris and set up his own label Mutiny Records. In 1996 he succeeded with I FEEL ALRIGHT a true Country / Folkrock masterpiece. The -leaver from the commercial ghetto Nashville, who lives and plays rock'n' roll (trade journal), surpassed himself. He had processed drug experiences ('Cocaine Can't Kill My Pain') and created intensive ballads like'Ellis Unit One' and offered a firework of rockabilly, bluegrass, folk and rock-hard biker-rock (Musik Express). Customer evaluation for "Sidetracks (CD)"